Jennifer Lin Russell is an associate professor of Learning Sciences and Policy in the School of Education and a research scientist at the Learning Research and Development Center (LRDC) at the University of Pittsburgh. She is also a fellow with the Carnegie Foundation for the Advancement of Teaching. 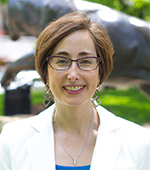 Her research examines policy and other educational improvement initiatives through an organizational perspective, and seeks to reshape the relationship between educational research and practice in order to accelerate improvement in the field. Her recent work examines two primary issues: (1) how schools create social and organizational structures that support reform; and (2) how inter-organizational collaborations can be structured for educational improvement. In the first strand she examines how teachers’ social networks influence their implementation of ambitious mathematics teaching practices, as well as how secondary schools organize to support the inclusion of students with special needs. Her second strand of research examines how organizations can productively collaborate to pursue educational improvement. Since 2014, she has worked with the Tennessee Department of Education, the Institute for Learning and a team of researchers at LRDC to test and refine a model for instructional coaching that can support mathematics teaching improvement throughout the state of Tennessee. Additionally, she is examining how networked improvement communities launch and develop to support efforts to address complex practical problems. For example she is tracking the development of the Tennessee Early Literacy Network and the Better Math Teaching Network. Her research has been funded by the Spencer Foundation, the Institute of Education Sciences, the National Science Foundation, and the Nellie Mae Education Foundation. Prior to pursuing a research career, Russell was a special education teacher in Oakland, CA and Williamson County, TN. Childs, J. & Russell, J. L. (2017). Turning around low-achieving schools: Building state capacity to support improvement through Race to the Top. Urban Education, 52(2). Bray, L. E., & Russell, J. L. (2018). The dynamic interaction between institutional pressures and activity: An examination of the implementation of IEPs in secondary inclusive settings. Educational Evaluation and Policy Analysis. Akiva, T., Russell, J., Hecht, M., & Crowley, K. (2018). Leadership in out-of-school learning: The educational doctorate program at the University of Pittsburgh. International Journal for Research on Extended Education. Briggs, J., Russell, J. L., & Wanless, S. B. (2018). Kindergarten teacher buy-in for standards-based reforms: A dynamic interplay between professional identity and perceptions of control. Early Education and Development, 29(1), 125-142. Russell, J. L., Kehoe, S., & Crowley, K. (2017). Linking in and out-of-school learning. In K. Peppler (Ed. ), Encyclopedia of Out-of-School Learning. Thousand Oaks, CA: Sage Publications. Russell, J. L., Bryk, A. S., Dolle, J., Gomez, L. M., LeMahieu, P. & Grunow, A. (2017). A framework for initiation of Networked Improvement Communities. Teachers College Record, 119(7). Gomez, L. M., Russell, J. L., Bryk, A. S., LeMahieu, P. G., & Mejia, E. (2016). The right network for the right problem. Phi Delta Kappan, 98(3), 8-15. Hannan, M., Russell, J. L., Takahashi, S. & Park, S. (2015). Improving feedback and support for beginning teachers: The case of the Building a Teaching Effectiveness Network. Invited to submit to a special issue of Journal of Teacher Education, 66(5), 494-508. Russell, J. L., & Sabina, L. (2014). Planning for principal succession: A conceptual framework for research and practice. Journal of School Leadership, 24, 599-639. Russell, J. L., Jackson, K., Krumm, A., & Frank, K. (2013). Theories and Methodologies for Design-Based Implementation Research: Examples from Four Cases. In B. J. Fishman, W. R. Penuel, A. R. Allen, & B. H. Cheng (Eds. ), Design Based Implementation Research. National Society for the Study of Education Yearbook(2). Russell, J., Knutson, K., & Crowley, K. (2013). Informal Learning Organizations as Part of an Educational Ecology: Lessons from Collaboration Across the Formal/Informal Divide. Journal of Educational Change, 14(3), 259-281. Dolle, J. R., Gomez, L. M., Russell, J. L., & Bryk, A. S. (2013). More than a Network: Building Communities for Educational Improvement. In B. J. Fishman, W. R. Penuel, A. R. Allen, & B. H. Cheng (Eds. ), Design Based Implementation Research. National Society for the Study of Education Yearbook, 112(2). Knutson, K., Crowley, K., Russell, J. L., & Steiner, M. A. (2011). Approaching art education as an ecology: Exploring the role of museums. Studies in Art Education, 52(4), 326-338. Stein, M. K., Russell, J. L., & Smith, M. (2011). The role of tools in bridging research and practice in an instructional improvement effort. In W. F. Tate, K. King, & C. R. Anderson (Eds. ), Disrupting Tradition: Research and Practice Pathways in Mathematics Education. Reston, VA: NCTM. Jennifer Russell is featured in the Pittwire Accolades for receiving a $1.4 million Bill and Melinda Gates Foundation grant for her project titled, "Conceptualizing and Measuring Network Health in the Networks for School Improvement (NSI) Initiative." The Tennessee coaching project led by LRDC's Jennifer Russell and the IFL's Victoria Bill is the subject of EdWeek's "Want to Improve Math Teaching? Try Coaching the Coaches." LRDC Research Scientist and School of Education Associate Professor, Jennifer Lin Russell, has been named to the National Advisory Board of the National Education Researcher Database (NERD). LRDC Research Scientist and Associate Professor, Education, Jennifer Lin Russell and her colleagues have been awarded a grant from the Nellie Mae Education Foundation for an "Evaluation of the Better Math Teaching Network." Jenn and her team will conduct a developmental evaluation of the network improvement community model, on which The Better Math Teaching network was designed. Jennifer Lin Russell has begun authoring a series of blog posts that appear on the Carnegie Foundation for the Advancement of Teaching website. Jennifer Lin Russell has been asked to be a member of the faculty for the First Annual Design-Based Implementation Research Workshop at the University of Colorado Boulder. Jennifer Lin Russell has been named a Fellow by the Carnegie Foundation for the Advancement of Teaching.